Please join us in honoring American Hero Justin Fitch at this year’s 3rd Annual Justin Fitch Memorial Ruck! 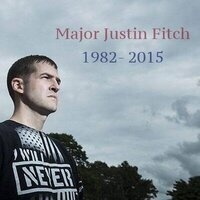 Justin Fitch was an MTU Graduate in 2005 and served as a Major in the United States Army. Tragically, Justin was diagnosed with metastatic colon cancer in May 2012 and passed away on October 4, 2015. After being medically retired from the Army in 2015, he was determined to continue to fight for his brothers in arms. Justin led a ruck march to bring awareness to the fact that 22 veterans a day take their own lives. Despite chemotherapy treatments and numerous doctor appointments, Justin fought and marched for his brothers until the day he died. In an effort to continue what Justin called “His Final Mission,” we have teamed up with Active Heroes, a 501c3 charity whose mission is to support all U.S. military service members, veterans and their families through physical, educational, and emotional programs in an effort to eliminate suicide. The Carry the Fallen Ruck March is a 4-mile hike where participants can choose to carry a weighted pack to symbolize the struggles that veterans go through every day. The Justin Fitch Memorial Ruck will take place at noon on October 6th, 2018 at the Chutes and Ladders Pavilion. Immediately following the event, there will be a cookout that everyone is welcome to attend. LTC Christian A. Thompson will partner with us when we dedicate the memorial that has been placed on the ROTC front lawn in honor of Justin. The official ceremony will begin at approximately 2:30 pm and all faculty, staff, students, and community members are welcome and encouraged to attend. I have had the privilege of overseeing this event the last three years and I continue to be amazed at the way our community has come together to support this incredible cause.